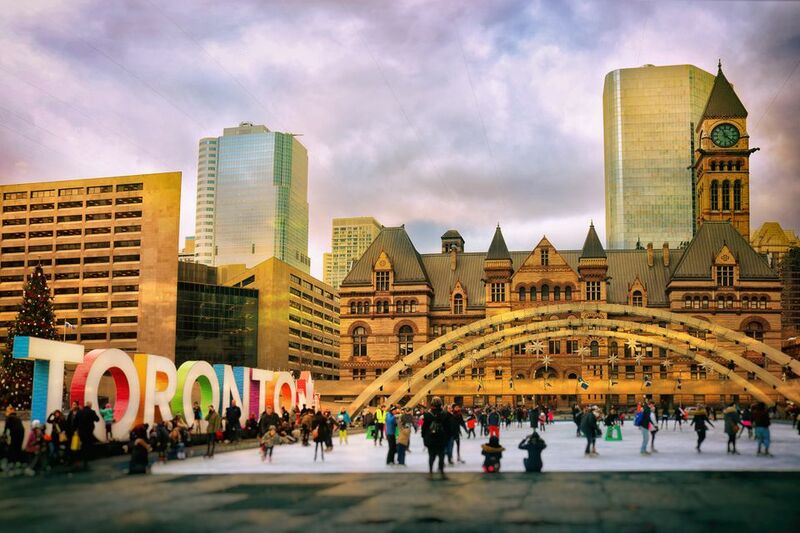 If you're looking for a cool cold-weather city to take in the winter, Toronto is the perfect escape. Plus, there are regular flight deals to get to the Canadian metropolis over the holidays, meaning you don't have to spend all your gift money on airfare. Toronto fully embraces the seasonal spirit with a wide array of holiday events to celebrate the season. If you’re wondering which ones to add to your list, here are six ways to feel festive in Toronto this Christmas. Get everything you need for the holiday season all in one place with a trip to the annual Seasons Christmas Show. Here you’ll find more than 300 exhibitors showcasing everything including Christmas decorations, gift ideas, stocking stuffers, and seasonal home accents, as well as food and drink ideas to cover all your holiday entertaining needs. The show takes place at the Toronto International Centre from November 16 to 18, 2018. The show begins at 10 a.m., but closing hours change depending on the day. Tickets cost $15 for adults and $12 for seniors and kids ages 13 to 17. Children 12 and under get free admission. Additionally, there are special events at the show worth checking out. The Polar Bar serves seasonal spirits, Santa visits for selfies, and the Salvation Army has a donation area. The best part is the holiday main stage that has free seminars about holiday decorating, entertaining ideas, and fashion inspiration. All things Christmas take over Yonge-Dundas Square on November 23, 2018. Expect live entertainment at 10 p.m. alongside a laser light show, an interactive Santa stage with the chance to take a photo with the man in red, daily caroling, a maple taffy station, a mini Polar Express ride for little ones and a warming station with free hot chocolate. In addition to all that there will also be holiday themed food and drinks, craft beer and vendors where you can pick up some holiday gifts. If you’re in the mood to feel festive, a trip to Yorkville for Holiday Magic can help. November 17 until December 31 sees Bloor-Yorkville transformed into a sparkling holiday-themed world complete with light displays, animated storefront windows and festive decorations all through the neighborhood. There will also be retailers with extended holiday hours making it easier to cross some gifts off your shopping list and holiday sales to be found at various stores. The official tree lighting ceremony with live music by Shawn Hook will be held on November 17, 2018 to kick off the season. Yorkville also hosts a Santa Speedo Run on December 15, 2018 if you can withstand the snow. One of the most festive spots in Toronto during the holiday season has to be the Toronto Christmas Market running November 15 to December 23, 2018. The entire Distillery District turns into a European-inspired Christmas market that has been ranked among the world’s best. So many people attended in past years that the 2018 market has been extended by one week and there will now be a $5 fee to enter on weekends, but the market remains free during the week. The 28-day festival includes Christmas tree lightings, music, holiday activities, food, beer gardens with mulled wine and hot toddies, craft vendors, distillery walking tours, and more. Black Creek Pioneer Village will be playing host to Family Christmas Weekends between November 17 and December 23, 2018 from 11 a.m. to 4:30 p.m. Here, you can visit Pioneer Village for festive family-friendly activities, music, food and drink (such as roasted chestnuts and homemade apple cider). During these festive evenings you can check out the many Victorian-style houses and workshops that come alive thanks to period actors. You can also see the holiday decorations, try your hand at seasonal crafts, listen to caroling and traditional folk music, and check out the gift shop for unique gifts made right on site. In December, there are horse-drawn wagon rides for $2 per person. Admission is $15 for adults and $11 for children ages 5 to 14. Cavalcade of Lights takes place on November 24, 2018, and it’s when Toronto’s official Christmas tree gets illuminated. The Toronto tradition, now in its 50th year, takes place at Nathan Phillips Square where there will also be skating parties, a fireworks display, and performances by some of Canada’s best musicians. It takes two weeks to decorate Toronto’s official Christmas tree, which usually stands 15 to 18 meters (55 to 65 feet).